Besides rice, Indonesian love to eat noodle. There are several types of noodles. The most popular noodle is the one which made from flour and egg. Other type of noodle that are used in Indonesian culinary, Bihun, made from rice flour and soun (bean thread noodles), made from starch (such as mung bean starch, yam, potato starch, cassava or canna starch), and water. This one is a recipe to make soun goreng. 1. To make the bean thread noodle soft and tender, place the noodles in a heatproof bowl and pour with boiling water for 1 minutes. Drain. 2. Grind or blend the ingredients of spice paste. 3. Heat 1 tablespoon of vegetable oil in a wok over medium-high heat. Make the scramble egg. Set aside. 4. Using remaining oil in the wok saute the spice paste over a medium-high heat until fragrant. Add green chinese cabbage, water (broth), cook until just tender. Then add the bean thread noodle, sweet soy sauce, and stir-fry for 5 minutes. Last, add the scrambled egg and the spring onion. Stir together for a minute. 5. 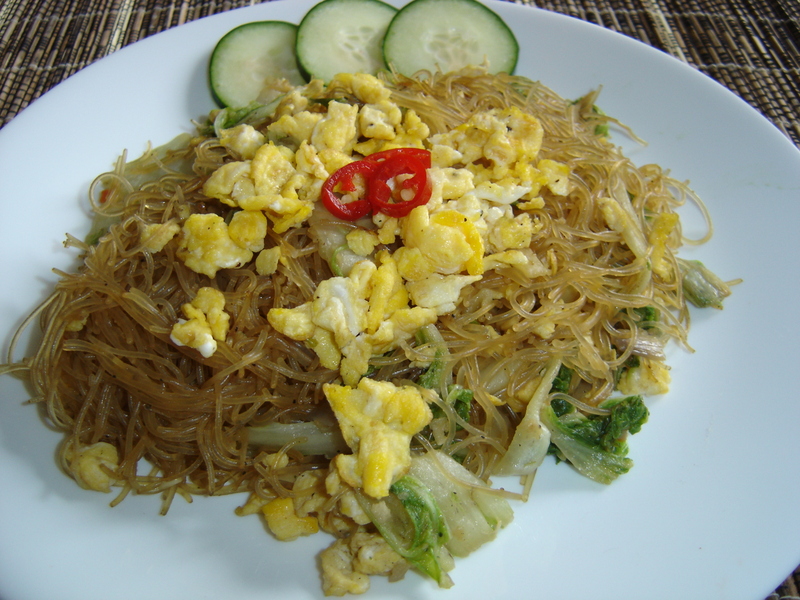 Serve fried bean thread noodle with fresh cucumber. Note : You can add other vegetable as well, such as carrot.